The Gold Medal award is presented biennially by the ZSSA Council for outstanding achievements in Zoology in Southern Africa over a number of years. Such achievements need not necessarily be limited to research results. Candidates are proposed and seconded by members of the Society. Should more than three nominations be received, a subcommittee consisting of the President, Vice-President and Honorary Secretary will narrow down the number of nominees to three. These will then be tabled at a Council meeting for a decision by ballot. The award is made at the banquet dinner during the biennially Conference. The ZSSA Council may hold over the award if suitable candidates are not nominated. The ZSSA usually awards the Gold medal in recognition of outstanding contributions to the Zoology over an individual’s lifetime during their biennial congress. This year the award was presented to Prof Colleen Downs during the Gala Dinner of the joint ESSA- ZSSA Congress held in Pretoria. Prof Downs has dedicated much of her research career to understanding how land-use change ecosystems, and how species respond under such conditions (responses may be ecological, physiological etc.). Prof Downs is arguably the most productive female natural scientist in South Africa. She obtained her PhD in 1990 and has published more than 200 peer-reviewed papers since then. She currently averages more than 15 publications per year with more than 20 publications for 2015 alone. Prof Downs focuses much of her work in KwaZulu-Natal and the Eastern Cape. These areas house some of the most threatened vegetation types in South Africa, and include a variety of species from birds to mammals. Her research, when taken together, provide vital information on how to manage threats and ensure the survival of species, not necessarily to prevent change (including land use), but ensure synergy and survival. One of the strongest aspects of her work is how to manage, and not prevent, change since this is inevitable. Prof Downs has an exceptionally good record in student training and mentorship and there are very few academics in South Africa that have successfully trained and mentored more young researchers. Importantly, her lab presents a nurturing environment where students, postdoctoral fellows and academics interact in a friendly yet learning manner. Although much of Prof Down’s work is locally focused, she has a good international standing. 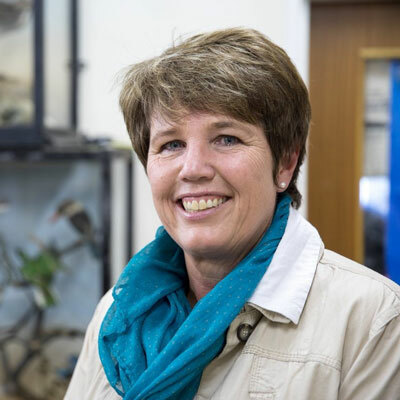 She is associated with the DST / NRF Centre of Excellence for Invasion Biology is an Elected Fellow of the International Ornithologists’ Union and has recently been awarded a prestigious DST/NRF South African Research Chair (SARChi). Her incredible contribution to conservation in South Africa was recognized by being nominated for the Mail and Guardian Green Trust Award (1999), and the number of international reviews that she performs. She has co-hosted / organized international meetings. She also routinely review for international journals.